Cat Scratching Post Useage: Save Your Furniture! Does Your Cat Have A Gleam In Their Eye For Your Couch? Get Them Loving Their Cat Scratching Post! it is in the room with the largest furniture - or that everyone (including the cat) is in most often. While you may not like the cat scratching post in the living room, it will help to save your furniture. Pick a colour you enjoy or that matches the decor - you will mind it in the room less if it blends with everything else. 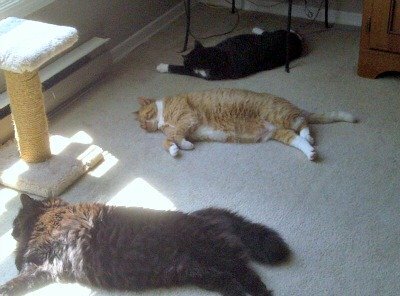 You may need multiple posts if your have more than one cat or a larger home with many rooms that the cats spend time in. We have 5 posts of different sizes throughout our house. Understanding why cats scratch will help you choose a cat scratching post. 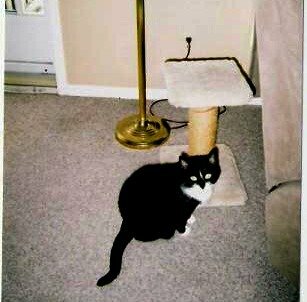 Start by sprinkling loose catnip on the base of the scratching post and rubbing it into the sisal to let them know that this part of the furniture is theirs. In the days after, if you see them scratching the post give them encouragement by kind words, some petting and maybe a treat. I have also taken the cats over to a new post and gently rubbed their paws on it while talking in an encouraging voice. Give them a few days to get used to the post - with catnip and encouragement - as most cats will prefer the feeling of a good sisal cat scratching post rather than the couch ends (not a cardboard scratcher - those things are not effective and don't last). If your cat is still into the habit of scratching your furniture, try putting the post right up against the area that they are scratching so that their only option is to scratch the post. Don't continue catnip use at this point - you don't want the catnip smell to rub off onto the furniture. When the cat has gotten used to scratching on the post, you can start slowly shifting it to where you would like it (it still will need to be in the room, though). Shift it no more than 6-12 inches at one time. If there are multiple scratching areas, one option is to push the post up against their favorite area and using something like Sticky Paws (sticky patches that you can purchase and trim to the size you need) or double sided tape on the rest. Don’t use anything really strong, like carpet tape or duct tape! If your cat has very large tufts of fur on the bottom of their paws, you may want to trim them a bit before using tape or Sticky Paws. With Sticky Paws, the idea is that if they can’t scratch or rub their paws on the area they will lose the habit of scratching there. (test an area first so you don't damage your furniture). 3 out of 4 beached in the living room. The post in the pic is in front of the window, so they can use it as a perch, too.